Yesterday I shared some of my resolutions and goals for the coming year. In all honesty, it was a little scary for me to do that- to put my “stuff” out there on the interwebs- but you know what? I am so glad that I did. By making those goals known to, um, the whole world (or at least the small part of the world that reads my blog), there’s a much greater chance I actually follow through on those babies. Let’s hear it for accountability! I mean, if I hadn’t announced to the world that I want to learn to dance, would I have gone on Amazon this morning and ordered HIP HOP ABSs ? I doubt it. And I’ll be able to take care of my exercise goal that way, too. Woohoo! You didn’t think I meant ball room dancing, did you? Anyway, today I’ve got no recipe. And no photo. What I do have is something new here- the first post in a weekly series I am hoping to continue for a year- a series I am calling “One Simple Change“. Some time ago, I created a list of what I will call “recommendations for a healthy lifestyle”: the types of things I used to talk about with patients when I was practicing naturopathic medicine. While some of these tips have made their way onto this blog in one form or another, I’ve been wanting to dedicate a space to them that was separate from my recipes, but just wasn’t sure how. So I’m going to try this format out: a weekly post that focuses on a change you can make in your life. A change that when practiced and cultivated into a habit will improve the quality of your life and help make you a healthier person. Rest assured this isn’t going to be “just a January thing”. Sure January is a great time to start anew with healthy habits, but so is May. And December. And you don’t have to start a healthy habit on the first of the month. Or on a Monday. Anytime you can make a change that will make your life healthier is a good time. So I’m going to do one post a week about simple changes for the whole year. That’s 50+ posts! I’ll try to do this on Fridays, just in case you’re the type of person who likes to ruminate over things on the weekend, then spring into action on Mondays (like me :). Depending on what the weekly tip is, there may be a recipe involved, and/or photos…but maybe not. It all depends on the focus of the post. Drink a tall glass of water within 10 minutes of getting out of bed. Why? When you wake up, whether you feel it or not, your body is dehydrated. After all, you’ve gone for hours without anything to drink. Room temperature (or even warm) filtered water is best, and a squeeze of lemon in there is excellent. Even if you are already a conscientious water drinker throughout the day, I want you to give this a try. Before you have coffee…or tea…or juice…or anything to eat…have that glass of water. Apart from helping with detoxification and hydration, I personally find that having a glass of water first thing just makes me feel as if I’ve started the day off right. I know I’ve done something healthy for myself right off the bat, and I am more likely to continue to make healthy choices for the rest of the day. So there you go. 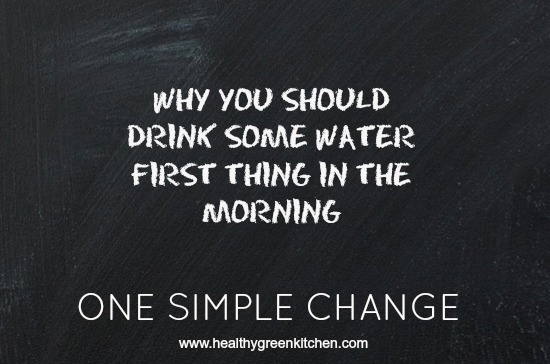 A simple change: drink a glass of water first thing. Are you in? I really like the idea of these posts Winnie and I can’t wait to hear your wisdom – this first one is a really great tip. I have a glass of water by my bed and I might have a sip or two when I’m getting dressed but quite often I get to work and realise that I haven’t had anything to drink all morning and I feel like the day has already got off to a bad start. I will definitely make the effort to have a glass of water first thing from now on! This is great Winnie!!! I am so looking forward to your posts!!! And this is definitely something I need to start doing. I keep a glass of water on my nightstand at night, but when I wake up its definitely not the first thing I consume. And drinking more water is definitely one of my goals for this year!!! I love Hip Hop Abs!!! Wait, you ordered it, right? SHAWN T!! Interesting – this was the first tip I received from a holistic health coach several months ago – go, Coach Winnie! I’m in! I’m pregnant right now and am drinking water like nobody’s business. I love the idea of downing a glass before trying at attack the day. Thanks! Love this! It’s always such a surprise what a difference even the smallest change in your routine can make. Also, looking forward to the other posts in this series. Hugs!! yes! I really like this idea. It’s something I try to do (sometimes). Think it’d be good to do it on a daily basis. Thx. I am definitely in. I resolved back in December to really drink more water, and I just love this. Now I need to go find my water bottle :) Thanks for the reminder and motivation, Winnie! Winnie, this is a great idea. I like the no pix, no recipe. Simplicity is good. I always, always have a glass or bottle of water within reach. It’s a habit I picked up as a child. My mom always made sure I had a glass of water to set on my nightstand at bed time (who knows why?? ), and decades (and decades) later I still have this habit. My kids are big water drinkers, too. So hopefully I’m passing along at least one good habit. Cheers and Happy New Year. LOL, I have hip hop abs too! It’s a lot of fun, a little silly when you first start but it’s a good time. GREAT resolution! I’ve been struggling the whole 2011 to get my water consumption up and just finally have been drinking 70oz consistently. Major question for you though…you said room temperature or warm is best??? Why? I heard a long time ago that cold water is better for your metabolism so I always drink my water cold. Now I feel like I’ve had wrong info all this time. LOL. Please advise…thanks! Sure in. I agree à more natural lifestyle is the way to get healthier and in shape. Tomorrow my frist glass! to drink it first thing. it really does make you feel better. How crazy? I’m doing just that! I read about this a few weeks ago, and I’ve made it my morning tradition. It does so much good. Thank you for sharing your goals for the New Year…you inspire me! In! Great theme, Winnie. And I just drank my glass of water. Great post! Can’t wait to see what else you share throughout the year. My only concern with this one (probably TMI) is that I get up everyday at 5 a.m., have a little something to eat, like 1/2 sm banana and a few sips of water, then I’m on the treadmill for an hour. If I drank a whole glass of water, I’d have to go to the bathroom more! It’s not so bad now, while I’m stuck on the treadmill at home, but during the summer I’d go running outside for an hour and always had to go to the bathroom! So I worry about drinking too much first thing. Is that dumb? Any solutions? I do this already – usually 2 glasses with lemon. I have a reverse osmosis system so if I don’t already have a full glass on the kitchen table, it comes from cold from the tap. I will try to leave a full glass before I go to bed. I can’t wait to see what the next tip will be. I just signed up … so timely! I am in! I look forward to your posts devoted to healthier habits. Great idea! This first one is terrific – when I wake up I head straight to the kitchen for a glass of water. I always feel dehydrated in the mornings, particularly in the winter. Happy New Year to you! I love this new series and I love your first *simple change*. I’m most definitely in! I’ve done this every morning for years. I drink as much as I can stand. I’ve been wanting to add lemon juice to it for years since it’s good for adrenals and liver detox but haven’t gotten into the habit yet. I crave water first thing in the morning! Even with my humidifier going all night long my body feels so dry in the morning. I drink a pint of room temperature water with juice from a half of a lemon every morning. I can’t wait to hear more of your simple changes. I just love the idea of this new series Winnie! And the way you write makes me actually want to do it :-) I’m in! I always have a glass of water in the morning, but sometimes my coffee does take priority…I’ll try to make sure to change that :-) It will take more work to drink room temp water, I really love it cold. I’m in with this…I remember when I was about 10 years old I was allowed to spend a week at a church campmeeting with our pastor and his wife. Every morning when I got up she had me drink a glass of water and told me that I should do that everyday. I also was told that ice cold water was not as good for me as room temp water…and we don’t drink ice cold water often. I keep bottled water in the kitchen corner by the case and both Grumpy and I drink it room temp. I always remembered what our pastor’s wife told me but never did keep doing it. Now as an adult (and an older one at that!) I think it probably is some really good advice. I’m going to plan to do this everyday…thank you for reminding me of it and giving me the inspiration to start it up! I am IN!!!! I was so excited to learn that you live in the Hudson Valley, So do we! AND that you are a Naturapath. Are you Practicing? I am in! Thx for sharing your wisdom with us over here on the North Oregon Coast. I have never been one to drink enough water, but, a few years back visited my first Naturopath and finally healed an ulcer that had been very troublesome. One of the first orders of business was to drink good water at warm temperature throughout the day..and yes, with lemon too. Your blog reminded me of the value of this simple but very healthful practice. I love the support! Since dealing with kidney stones for a long time now, I’ve become used to the idea of drinking a lot of water every day. I drink at least 10 (8 oz) glasses every day. The first glass is right when I get up in the morning. Not only do I feel better but I’ve lost weight as well.